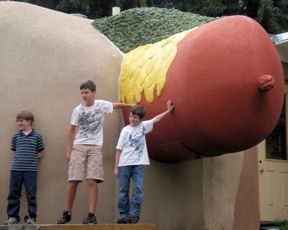 The giant hot dog along US285 west of Bailey rates almost iconic status in Colorado. At 42 feet, Coney Island claims the title of longest hot dog in Colorado; nestled in a 35-foot long bun and topped with mustard and pickle relish. The unique roadside eatery was constructed on Denver’s Colfax Avenue in 1966. Four years latter the structure was moved to Aspen Park in the Denver foothills. 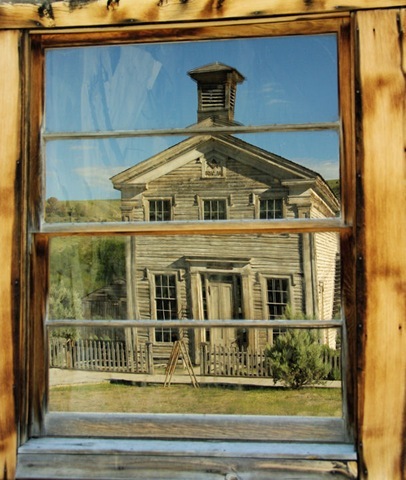 Travelers headed to or from the mountains frequently stopped for hot dogs, burgers or ice cream – a tradition for many families. Coney Island was slated for demolition in 1999 to make way for a bank. On closing day the line stretched for miles – customers waiting for one last Coney Dog. 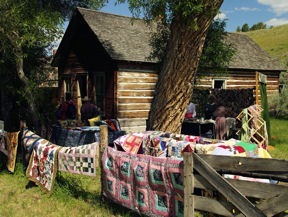 Fortunately a buyer and new location was found on the banks of the South Platte River. The 18-ton hot dog made a 17-mile trip west to Bailey. The menu offers All American hot dogs with all the usual condiments toppings of cheese, chili, kraut or slaw. 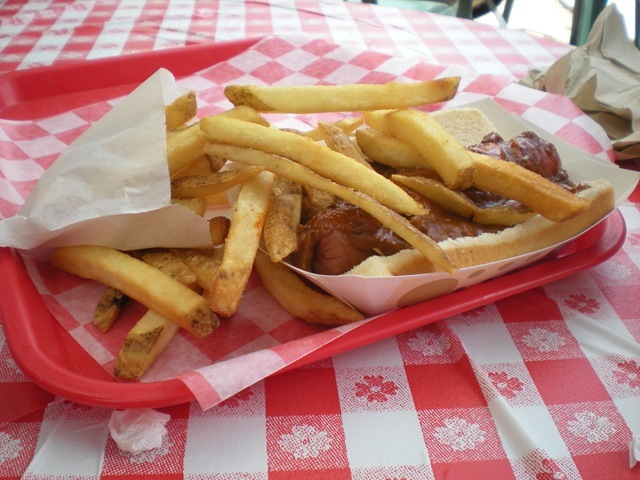 Specialty dogs include corn dogs, brats, hot Polish, smoked buffalo and smoked elk jalapeno cheddar. For those who don’t do “dogs” burgers are also available. We recently joined the noon-time line to place our order for chili cheese dogs and fries. 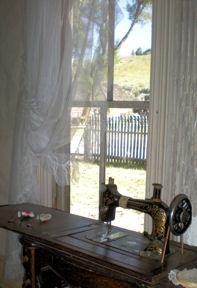 Inside seating is limited to two small tables and a few counter stools. We choose a umbrella shaded table on the deck while others selected picnic tables on the riverbank. I wouldn’t claim this is the best hot dog I’ve never eaten but worth the stop in a fun atmosphere; after all, it’s a Colorado tradition. Don’t forget to take pictures of the kids and the giant hot dog. 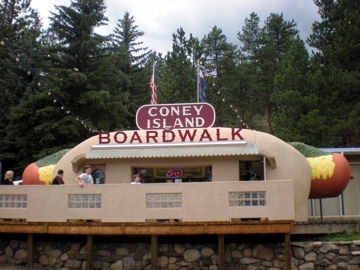 When You Go: Coney Island Broadwalk is located at 10 Old Stagecoach Road, Bailey, Colorado – phone 303-838-4210.m Open 9am – 9pm on weekends, 10am – 9pm weekdays. 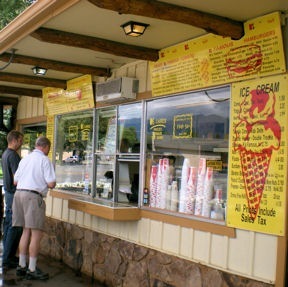 A July mid-afternoon in Buena Vista, Colorado practically requires a stop at K’s Dairy Delight. The menu says, “One location serving the nation!” I count license plates from ten states when we pull into the parking lot. The line is long but no one’s complaining. Many customers order burgers but it seems everyone wants ice cream in the form of cones, shakes, malts, floats, sundaes, parfaits or banana boats. The soft serve ice cream is legendary. Choose a regular, waffle, dipped, twinkle cone or a doubleheader. 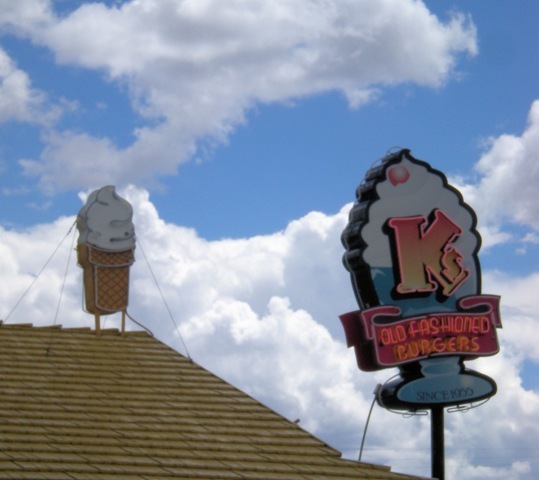 The Urban Spoon website ranks K’s as the best ice cream in Colorado, I mumble, “yum” several times as I finish my vanilla cone and wish for a doubleheader. Definitely worth the wait. We couldn’t resist stopping again on our return trip. 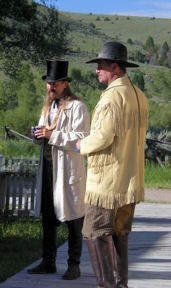 This time Bob and I order caramel shakes – WOW! Michael gave his black raspberry shake great reviews. Columbine Park across the street provides picnic tables and plenty of shade for relaxin g while consuming K’s Dairy Delite treats. 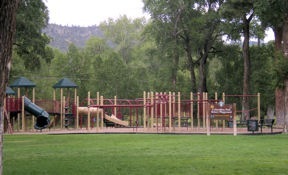 A large playground will wear off youthful energy before getting back in the car for the next leg of the journey. 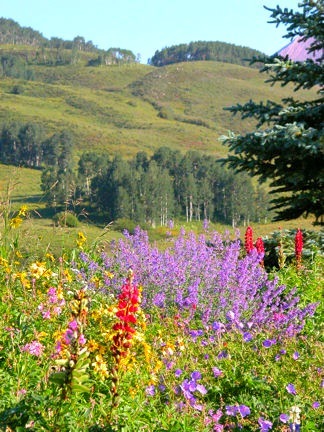 When You Go: K’s Dairy Delite is located at 223 Highway 24 South, Buena Vista, Colorado; 719-395-8695. The name made we smile, the recommendation was glowing, location and timing were perfect for Friday dinner at the Naughty Moose in Conner, Montana. 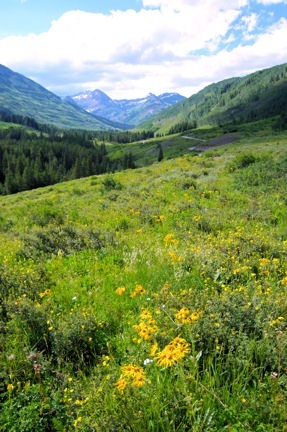 Located in the Bitterroot Mountains of western Montana, Conner is located 76 miles south of Missoula and 21 miles north of Lost Trail Pass – the Continental Divide crossing between Idaho and Montana. Our B&B host exalted high praise when suggesting the Naughty Moose. 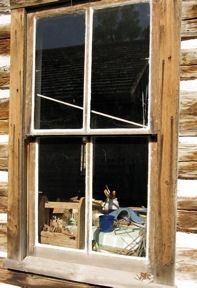 From the exterior the log building appears more bar oriented than cuisine centered. Happily we found that not to be the case. 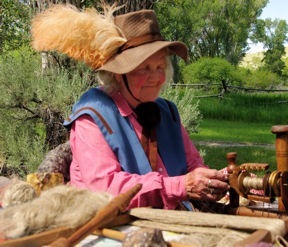 Locally-made log furniture and an array of antlers, horns, skins and mounted trophy heads decorated the two dining rooms. A very good margarita eased the day’s road pain as we ordered and awaited our salads and “Naughty” buns. 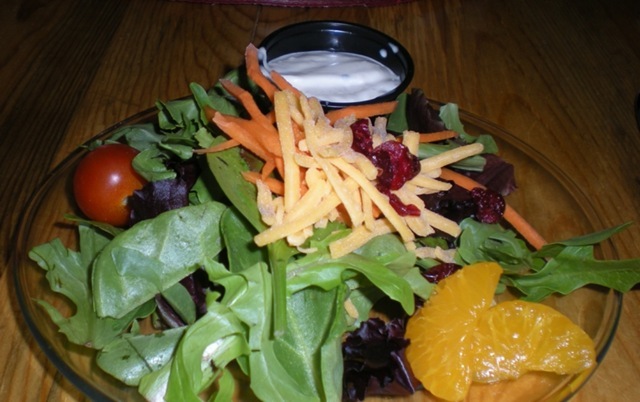 The salads were fresh and attractively presented with spring greens, cherry tomato, mandarin orange slices and dried cranberries topped with shredded carrots and cheddar. The house dressing, a creamy garlic parmesan proved an excellent choice. 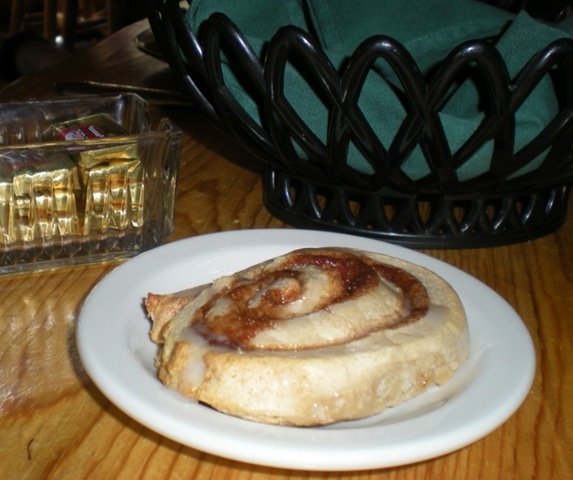 “Naughty” buns are lightly glazed cinnamon buns. Since they aren’t excessively sweet they made a tasty accompaniment with the salad. 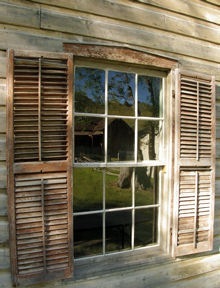 The panfried chicken dinners were extremely tempting, longing to once again savor fried chicken like my Aunt Ellen’s. Because the chicken is panfried the old-fashioned way, orders take at least 45 minutes. We were too hungry and still had too many miles to drive to wait. Totally satisfied after our entrees we passed on the dessert offerings. Or, to stop in the bar and listen to the live music. A trio, Code of the West, was playing and I believe we would have enjoyed hearing a set. By the time we left the dining rooms were nearly full, many of the tables taken by three generations of families starting their holiday weekend. 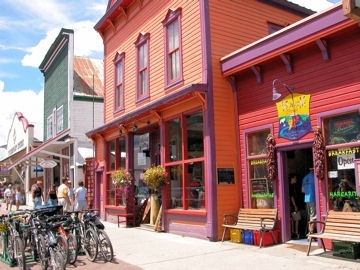 Hopefully our return trip through Montana will include another tasty meal at the Naughty Moose – perhaps the panfried chicken. When You Go: Naughty Moose, Mile Marker 21, Highway 93 South, Conner, Montana, 406-821-9955.Open Daily 2-9pm, Breakfast Sat. & Sun. 9-noon. Full bar, beer and wine. Prime rib served nightly.